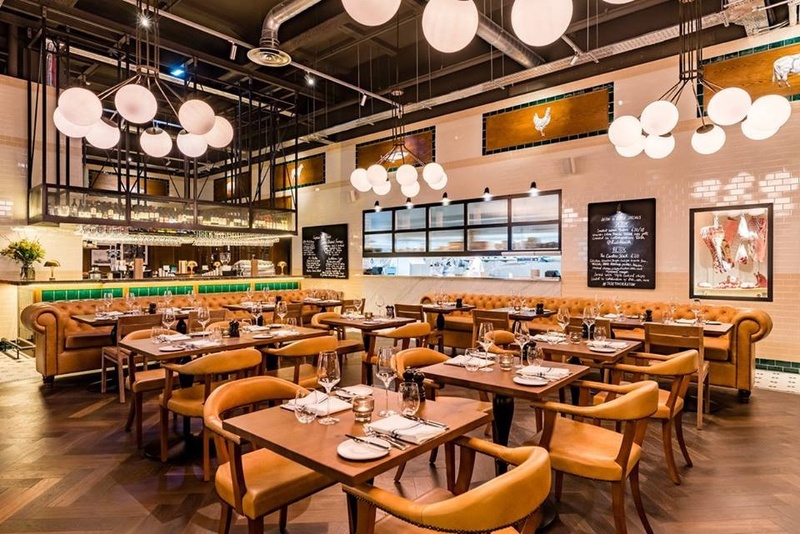 There's been quite a buzz surrounding the opening of Tom's Kitchen at the glamorous Mailbox in Birmingham city centre, but that's because the man behind it is English Michelin Star-winning Tom Aikens. 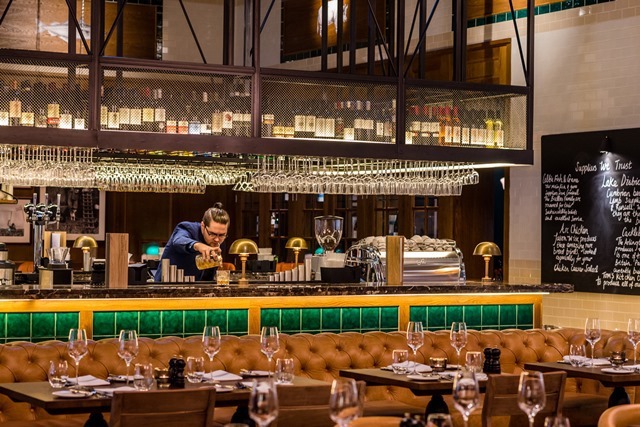 It's Aikens' first UK Tom's Kitchen restaurant outside of London - he has five in the capital and one in Istanbul - which is located right next to the entrance to Harvey Nichols. Interestingly, it's inside the Mailbox, set apart from where most of the other restaurants are, near the canal at the rear. With the front area of the restaurant open and overlooking the Mailbox walkway, it means diners can watch the world go by or passing celebrities from the BBC studios. Chef Aikens gained acclaim at 26 when he became the youngest British chef ever to be awarded two Michelin stars but he became a household name after reaching the final banquet on BBC show The Great British Menu in 2013 with his Chicken Egg, Egg Chicken starter. This isn't a Michelin starred restaurant, but it's a high-quality casual dining brasserie with food influenced by a Michelin-awarded chef that comes at a very fair price. 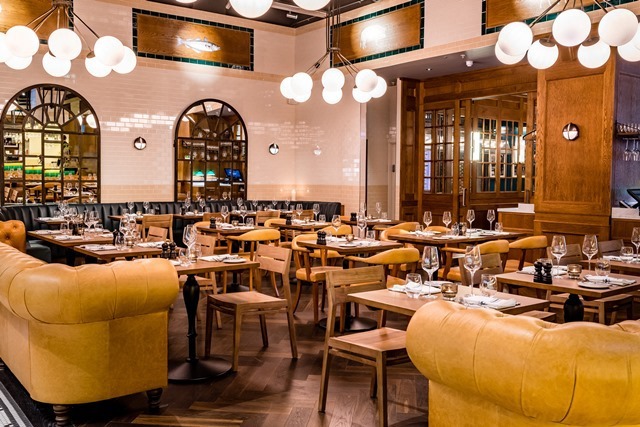 Aikens has created a collection of menus for this Birmingham Tom's Kitchen, which are then brought to life on a daily basis by Head Chef Tom Wells & his team. The menu features well-known favourites that have been elevated to a higher level. Added to that is good service by staff who are well versed in the menu and for making recommendations. Diners are welcomed to a stylish, relaxed ambience where gentle jazz music plays and there's an enticing American style bar with wooden booths immediately by the door, while Victorian style tiles enhance the room. There's space for 96 covers, as well as two private dining rooms, but seating to the rear, next to the bar, is more enclosed and has a good view of the open kitchen. This is definitely a preferred spot if you can book early. Here, there are sofas to dine from too. Starters are priced between £7 and £15 and include spicy crab cake, pan fried scallops, steak tartare and macaroni cheese. Some of the dishes may sound pretty ordinary, but they are executed with fine detail and are combined with other more adventurous flavours. 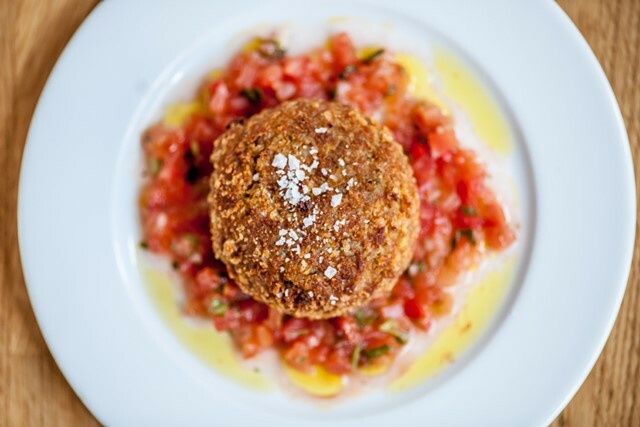 The spicy crab cake (£10) has a generous amount of heat that is balanced by the crisp bed of chopped onion, coriander and tomato with cucumber chilli relish. While the pan fried scallops (£15) exemplify the quality of sourcing for the restaurant's produce with three fresh, large, thick and meaty scallops alongside a generous slice of black pudding that are laid out on a creamy pine nut risotto infused beautifully with herbs. Moving on to the main event, there are usual offerings of gourmet stacked burgers, fish pie and fish and chips (ranging from £15-£16) but also more distinctive options of guinea fowl with confit duck, bacon, spelt and barley risotto (£23) or Cornish venison with red wine poached pears, braised leg croquette, beetroot gratin and beetroot puree (£26). There are steaks too and plenty of them - 225g Cumbrian rib eye steak (£26) or 250g rump steak (£22) as well as a sharing plate of a 650g Angus Cross Chateaubriand steak (£65) - that all come with gorgeously crisp fat triple cooked chips and bearnaise or peppercorn sauce. I opted for the herb crusted poached monkfish (£24) which came with a delightfully sharp escabeche and a saffron sauce. It was plump and meaty and cooked well but it needs an accompaniment and a few of those fat lovely chips went down a treat. If you want something healthier, there are sides at £4 of seasonal options like spiced Autumn squash, cauliflower cheese, salads, spring onion mash and more. My companion was served up a huge chicken schnitzel that came with a red pepper relish sauce and courgette and was so generous that he couldn't quite finish it, despite finding it deliciously crisp. On that note, it is important that you leave room for dessert as the chocolate and peanut butter fondant (£8) is to die for. With vanilla ice cream and caramel sauce, the dish is worth a visit to this restaurant for that alone. It's simply heaven in a shallow bowl. The flavours melt together in your mouth to perfection and will leave any chocolate lover thoroughly satisfied. Other options include a more sedate but fine blackcurrant cheesecake (£7) and berry sorbet that had fresh blackcurrants and honeycomb pieces on top. It still made you want to lick the spoon clean. 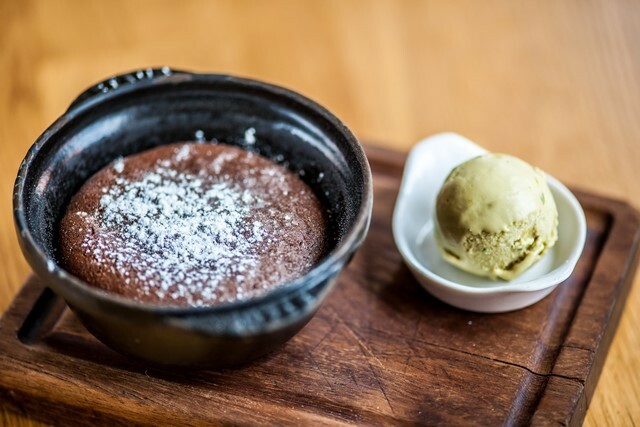 Most of the desserts are priced between £6 and £8 and there are nostalgic choices like a plum bakewell tart and sticky toffee pudding, that comes to share at £14. What's refreshing is that Aikens isn't shortchanging customers. The portion sizes are all generous for a moderate price, especially considering the high quality of the food and expertise in cooking it. A three-course meal would be around £35 to £45 per person, dependant on choices, which really isn't too bad. Obviously, alcohol pushes up the price but there are some fine wines and classic cocktails (£9-£10) to tempt you. The waitress recommended we had a Picpoul de Pinet 2015 white wine from the Port of Meze in Languedoc that was crisp and combined beautifully with the meal. But it's just one of many carefully chosen wines on the list. On the cocktail front, there are regulars like a spiced rum old fashioned, negroni or brandy alexander or you could keep it dry with a celery and watercress cleanser or Potassium Kick. Those drinks are obviously geared towards the morning after when diners can come early to enjoy brunch classics like eggs royale(£12), brioche French toast(£9), seasonal berry pancakes(£9.50) or the classic - a Tom's full English at £14.50. Aikens had said that he decided to embark on a venture in Birmingham because it's a "vibrant and bustling city with a thriving food scene" and that he thought Tom's Kitchen would "offer an exciting new option for diners in The Mailbox". Well, he has done just that as Tom's Kitchen is going to give tough competition to the other eateries nearby as this is clearly food with a touch of class and the best restaurant to eat in the Mailbox right now. Open daily for lunch, dinner and weekend brunch. Tom's Kitchen Deli in front of the restaurant also offer express homemade food to go. Book a table via Tom's Kitchen website.